Espionage or a simple theft, of the UMNIK official in Pristina?! In a video provided by RTV Dukagjini, there are two UNMIK officials in Kosovo, who perform a sophisticated robbery at a clothing store in Pristina. While the expert of intelligence Agim Musliu thinks this is a spying, as the UNMIK official is from Russia. According to him, this case should be investigated by the relevant institutions. 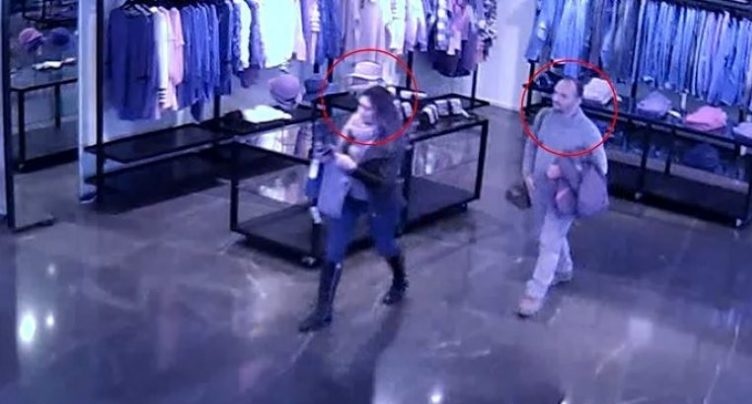 As in the movies, an UNMIK official of Russian citizenship and an official of Albanian nationality were caught by security cameras stealing a purse at one of Pristina's stores. RTV Dukagjini managed to provide this exclusive video, which shows the action of the official in question. In the video the couple is seen avoiding a handbag, entering the wardrobe with it, suspected of having removed the alarm fuse and leaving the wardrobe. Jana Minochkina is a political advisor to UNMIK and an ambassador of the OSCE youth in Kosovo. She is married to the Albanian, Luis Bekteshi. In the Kosovo Police report is said that two officials have been detained after the act of the theft, as shopkeepers noted strange behaviors and reported the police. "Jana Minochkina and Luis Bekteshi were escorted to the police station. There they stated that are UNMIK officials," the report said. The case was confirmed by Chief Prosecutor Imer Beka who indicated that the investigations are initiated regarding the case. Beka said he had talked with the case prosecutor who said the investigations had started. Security authorities suspect that beyond theft this is an act of espionage. This is also claimed by security expert Agim Musliu. According to him, all this is well thought act. "For me, in my profession, this cannot be categorized as a simple theft. Knowing her [Russian] status, this seems an operational activity of the Russian intelligence service," Agim Muslia declared to RTV Dukagjini. In the footage provided by RTV Dukagjini is seen of how Jana does this unusual act of theft. According to Musliu, security forces must deal with this case in detail and not leave it in this way. "The shop where the theft happened is close to the three main institutions of the state of Kosovo. So very close to the Presidency, the Government and the Assembly ... Consequently, I have doubts she is an infiltrated agent...Perfect conditions are met, as she is married to an Albanian man." security expert Agim Musliu said.